Posted by Bruce Carroll at 3:34 pm - December 7, 2012. WASHINGTON — The U.S. Supreme Court will decide whether California’s Proposition 8 marriage amendment is constitutional and whether the federal government can refuse to recognize gay couples’ marriages for tax purposes and other reasons, the court announced Friday. The long-awaited announcement, first reported by SCOTUSblog, puts Section 3 of the Defense of Marriage Act, which defines “marriage” and “spouse” in all federal laws as being limited to marriages between one man and one woman, squarely before the nine justices in the case of Edith Windsor. The court also accepted the request by the supporters of California’s Proposition 8 that the justices hear an appeal of that case, in which the Ninth Circuit Court of Appeals struck down the law as unconstitutional. In addition to the questions about whether the laws are constitutional, the court has asked the parties to respond to questions about “standing,” a constitutional limit on who can bring a case before the court because of a constitutional limit that courts only can hear actual “cases and controversies.” If a party doesn’t have standing to bring an appeal, the court cannot hear an appeal. “Last month, voters from Maine to Washington stood up for equality. Now it’s time for the Supreme Court to catch up with the American public. Discrimination and hatred have no place in a country founded on the principles of liberty, justice and equality. “Despite the efforts of a vocal minority, from politics to business to culture we are seeing a rapid and historic shift towards equality for all. Only a year ago, Don’t Ask Don’t Tell was repealed. Now, no one cares. Sooner than later, no one will care about loving gay and lesbian couples marrying any more than they care about their straight counterparts doing so. “Additionally, gay and lesbian couples in California – and indeed, all over the country – now look to the Supreme Court to affirm that the Constitution does not permit states to strip something as important as the freedom to marry away from one group of Americans. Posted by B. Daniel Blatt at 3:23 pm - December 7, 2012. So, now AOL/HuffPo is noticing FEMA’s Sandy Failures? 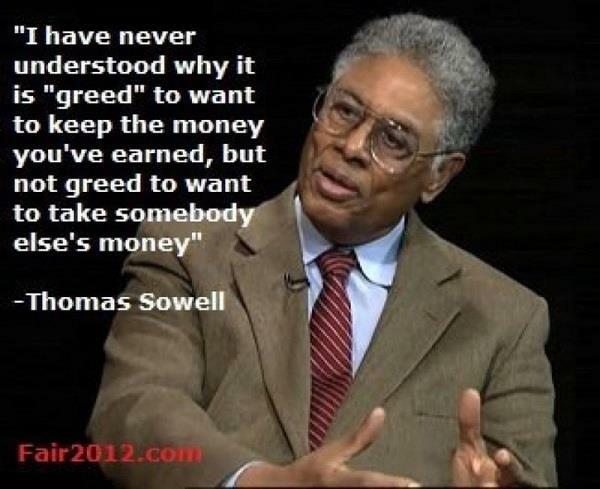 Posted by B. Daniel Blatt at 3:18 am - December 7, 2012. 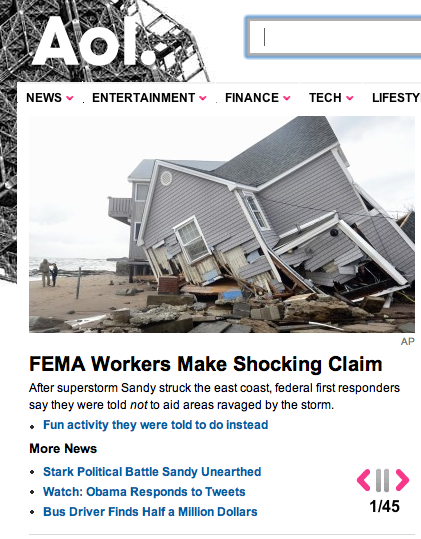 That image/headline even linked an article on FoxNews: EXCLUSIVE: FEMA teams told to ‘sightsee’ as Sandy victims suffered. Here’s more news of FEMA’s incompetence, much of which is coming to light only after the election. Angry New Yorkers say Obama pledge to cut red tape ignored by FEMA. It’s more than a little bit scary when you recognize the ability of the MSM to influence the perceptions of Americans as to the truth of what is going on. Before Katrina hit Navy and Coast Guard ships positioned off the coast, MREs and water were stockpiled in the Superdome, FEMA positioned medical teams and specialized personnel outside New Orleans, and aircraft were positioned to assess damage and carry out rescues. After the storm hit the responders carried out the largest post-war air rescue ever. A constant stream of helicopters ferried survivors out of flooded areas to safety. And yet the meme that Katrina was a failure of leadership saturated the news and talk shows for months. It was a politically motivated false narrative then just like the Sandy narrative now. If Obama has been president in 2005, then we might certainly have learned of all the preparatory work that FEMA, the National Guard and the Coast Guard had done.